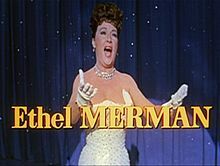 Known primarily for her big voice, Ethel Merman (January 16, 1908 – February 15, 1984) was a Tony Award-winning star of stage and film musicals. She was born and raised in New York City. Her mother was a school teacher and her father was an accountant in Manhattan with a wholesale dry-goods company, James H. Dunham & Company. As a performer, she was duped a few times after being promised roles in musicals. 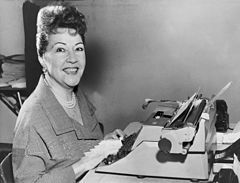 Despite her show-business talent and being raised by an accountant, she didn’t have success with businesspeople, including three of her four husbands (William Smith, a theatrical agent; Robert Levitt, a newspaper executive; and Robert Six, a pioneer in aviation as president of Continental Airlines). Ostensibly, she got solace from her singing roles. So figuratively, she sometimes sang the blues — just like many small businesses. 1. Have a business plan. It isn’t always necessary, but a business plan is usually imperative. You’ll need to have a financial forecast for cash flow. So you need to know your financial needs, your challenges from competitors, and how you’ll sustain your growth and survice. So you’ll need a break-even analysis, profit and loss forecast and a cash flow analysis (see Primer for Best Practices in Preparing Financial Statements). 2. Be pragmatic in your planning. Don’t start with a large loan whether it be from banks, credit cards, home equity lines of credit or borrow from someone you’ll be obligated to repay. Don’t plan on a profit right away — it rarely happens. Watch your expenses. Be very frugal. Don’t overspend. 3. Choose the right ownership structure. Consider your potential liability. Decide whether to be a sole proprietor, set up a partnership, establish a limited liability company as an LLC or corporation. Select the right one to protect your personal assets. 4. Plan for efficiency and productivity. Hard work isn’t a cure-all for success in business (see Business Success Checklist to Work Smarter, Not Harder). 5. Don’t forget about marketing and sales. You’ll find countless tips in the Marketing and Sales section here on this portal. 2. Hire talented people and don’t micromanage them. Define their roles and train your employees but let them do their work by not micromanaging them. You’ll generate loyalty, trust and productivity. You need to focus on the big picture. 3. Focus on productivity and eliminate clutter. The first hour of every day should be spent addressing your biggest headache, then focus on marketing and sales. Have a clean and orderly work area. 4. Share your vision. By hiring the right people and sharing your vision for growth, your employees will excel. One of your objectives should be a turnkey operation so you can focus on sales and the big picture. If you want maximum profit, consider partnering with your employees (see Profit Drivers – How and Why to Partner with Your Employees). 5. Budget time for family, rest, recreation and exercise. Owning a business is one of the most difficult challenges of all (see 30 Time Management, Stress Reducing Tips). 1. Save and organize your receipts. Receipts of small expenditures might not be required in your tax returns, but save them as documentation for your writeoffs. 2. Get a competent bookkeeper. In the long haul, it will save you time and money and help you to increase profits. The job will be swiftly finished and you’ll benefit from having a second person to spot problems and offer solutions. But remember Embezzlement is a widespread nightmare (see Embezzlement – 21 Tips to Protect Your Nonprofit or Company Assets). 3. Record your reimbursable expenses. Don’t make the mistake of paying bills on your personal credit card or out of your wallet, but then failing to keep track of them so the business can reimburse you. 4. Make sure you communicate well on your financials. Business owners often fail to communicate on financial matters, such as providing information on transactions and receipts for the bookkeeper. 5. Know your financial situation. Reconcile your bank statements with your books every month. Cash flow is paramount and you’ll want to avoid errors. And make sure you protect your bank account from cybercrime (see Small Business Tips to Protect Your Bank Accounts). 6. Create paper trails and backup your financial records. In the event of computer failures, backups are essential. You should also keep the hard copies for a paper trail (see 5 Data Recovery Planning Tips for Computer Failures). 7. Make sure you deduct sales tax from your total sales. If you fail to do so, you’ll show an mistaken total sales amount and you’ll be responsible for the tax. 8. Follow GAAP or generally accepted accounting priniciples. Make certain that expenses and other transactions are correctly categorized and set up as few categories as you can. 9. Maintain an accurate petty-cash system. Whenever money is taken out of the petty cash, documentation should be inserted in the file. So, when you expend all the petty cash, you’ll have documentation that equals the original petty -cash amount. 10. Avoid problems with state and federal regulators by properly classifying your workers. In this day and age, companies are hiring contractors but fail to remember they’re not bonafide employees. Unless you’re using a staffing firm for workers, non-employees are not usually allowed to use your equipment and you’re not to direct their activities as you would an employee. 11. Don’t hire employees you don’t need. Recordkeeping, unemployment taxes, workers’ compensation insurance are all expensive. 12. Don’t rent space you don’t need. And if it’s possible, work from home. 13. Know how to collect receivables. Inevitably, you’ll encounter situations where clients and customers fail to pay on time. 14. Pay attention to pricing. Learn to manage the sweet spot – between your price-optimization and costs (see Strategies for Stronger Profits by Optimizing Prices). 15. Watch the chargebacks. Increasingly, merchants are being victimized by chargebacks in illicit of behavior credit-cardholders (see Plagued by Chargebacks? 5 Ways to Fight Back). For the Best Cash Flow, Manage Your Inventory Costs with 8 Tips — With proper inventory management, you can lower your expenses and increase your cash flow. For many businesses, that means taking a look at your inventory costs. When your products aren’t selling, obviously, it hurts. 13 Management Tips to Solve Employee Absenteeism — Absenteeism causes migraines for a lot of bosses. Obviously, your company will make healthier profits, if you don’t have an absenteeism problem. Check your attendance records. Monday is the most-abused day of the week and January is the worst month for absenteeism. Why Companies Fall into the Management Lawsuit Trap — News headlines continue to show there are a myriad of ways managers set themselves for lawsuits. Small and many big companies are ripe for EEOC complaints. In one year alone, 2011, AT&T was forced to settle an age-bias lawsuit.